Ava Seelenfreund of Truckee was taken down hard in the penalty area four minutes into Friday’s girls Class 3A girls state semifinal Bettye Wilson Soccer Complex. It was arguably the only downer she had the entire game. 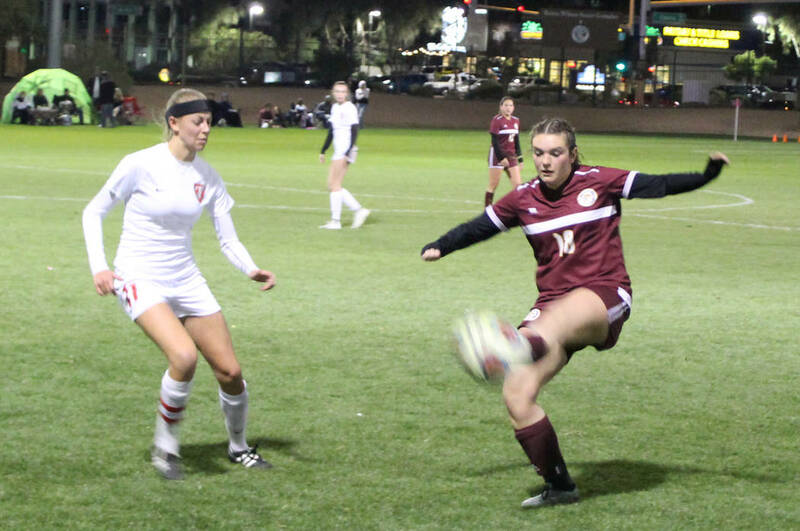 Seelenfreund finished with a hat trick and an assist as the Wolverines overwhelmed Pahrump Valley 7-0 to advance to the state championship game at noon Saturday against South Tahoe (24-2). Seelenfreund was awarded a penalty shot after she was knocked down, and she promptly banged it into the back of the net to give Truckee (19-5) a lead they never relinquished. 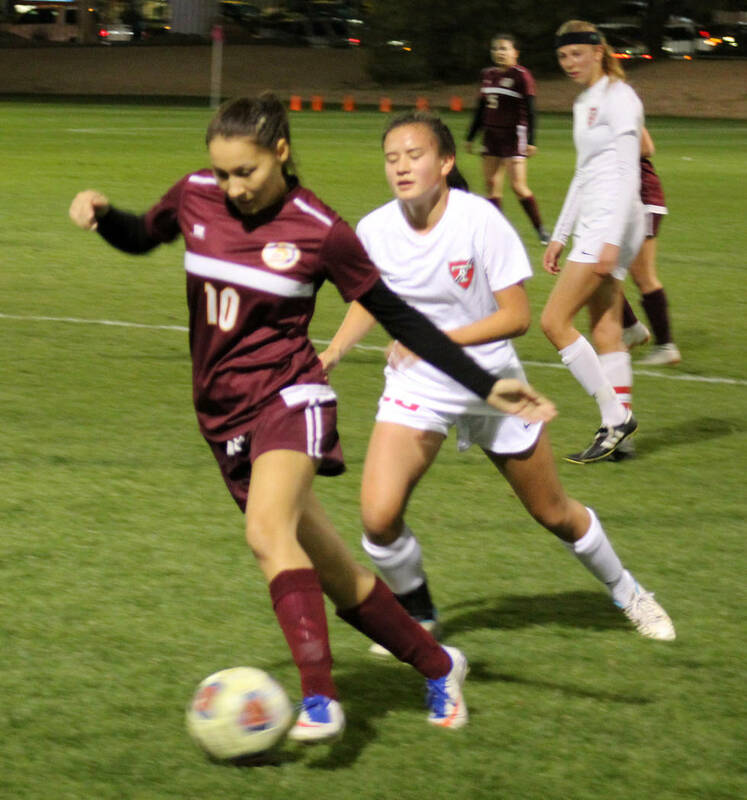 Amber Simonpietri added a pair of goals for Truckee, and Isabel Gonzalez and Taya Matt also scored for the Wolverines. Goalkeeper Daphne Lezo Duran had 11 saves to get the shutout. Pahrump (15-5-2) had a hard time slowing the Truckee attack partly due to injuries coach Julie Carrington said. “That always makes it tough,” Carrington said. “They are fighters. They don’t give up. They got here two years in a row because they are a good team. We just need to work on some things before next year. South Tahoe 2, Western 0 — In the other girls semifinal, Phoebe Barkann stopped all seven shots for the Vikings as South Tahoe eliminated Western. The Vikings used a suffocating defense to frustrate the Warriors. Western only got three corner kicks in the final 50 minutes of play. South Tahoe got its first goal 21 minutes into the match, as Giovana De Loia used her left foot to hit the lower right corner of the goal for a 1-0 Viking lead. The Vikings added insurance in the 76th minute, as Morrison Salmon’s high-arcing shot just sailed past the fingertips of Maria Yanez, and South Tahoe made it an all-Northern Nevada state final. Western’s best chance to score came in the 78th minute, but Angelica Sanchez’s free kick from 30 yards out hit the crossbar. The Warriors end their season at 14-6.